NOVEL CHATTER: Films from books get the Oscar© nominations again! Films from books get the Oscar© nominations again! As usual, films based on books, plays or other written sources got a ton of Academy Award© nominations!! Here's a quick over view of the nominated films and their forms of adaptations! The "adapted" nominations are always my favorites because there's a fleshed out STORY behind the screenplay. Please note, the item below was found on SHELF AWARENESS PRO and it was too darn good not to share. Lincoln, based in part on Doris Kearns Goodwin'sTeam of Rivals, was nominated for best picture, best director (Steven Spielberg), best actor (Daniel Day-Lewis), best supporting actor (Tommy Lee Jones), best supporting actress (Sally Field), best adapted screenplay (Tony Kushner) and led the field with 12 nominations. Life of Pi, based on the Yann Martel's novel, was nominated for best picture, best director (Ang Lee), best adapted screenplay (David Magee) and finished a close second with 11 total nominations. 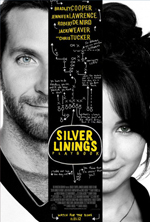 Silver Linings Playbook, based on the novel by Matthew Quick, was nominated for best picture, best director (David O. Russell), best actor (Bradley Cooper), best actress (Jennifer Lawrence), best supporting actor (Robert De Niro), best supporting actress (Jacki Weaver), best adapted screenplay (David O. Russell) and had eight nominations overall. Les Misérables, based on the novel by Victor Hugo, was nominated for best picture, best actor (Hugh Jackman), best supporting actress (Anne Hathaway) and earned eight nominations. Argo, based on the book by Antonio Mendez and Matt Baglio, was nominated for best picture, best supporting actor (Alan Arkin), best adapted screenplay (Chris Terrio) and had seven nominations. Other multiple-nomination book-to-film adaptations included Anna Karenina in four categories and The Hobbit: An Unexpected Journey in three. 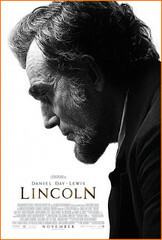 I haven't saw Lincoln or read the book (I understand the movie is a small part of the overall narrative). I haven't read Doris Kearns Goodwin's Team of Rivals but it is on the top of my list.